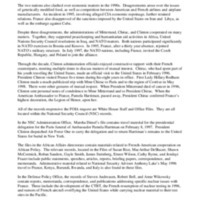 Identifier is exactly "2008-1184-F Segment 1"
This collection consists of records regarding relations with France during the Clinton Administration. Despite areas of tension on nuclear testing and economic matters, President Clinton enjoyed a constructing working relationship with French Presidents Francois Mitterand and Jacques Chirac and cooperation on humanitarian, United Nations, and NATO activities. President Clinton also visited France five times during his eight years in office. The records in this collection include correspondence, memoranda, press materials, reports, briefing papers, speeches, and publications.